Photographs snapped during the Vancouver riots have touched off a major police investigation aimed at identifying vandals and thieves. Thousands of pictures and hundreds of videos were taken following the Vancouver Canucks' loss in Game 7 of the Stanley Cup Final on Wednesday, many appearing to capture people in the act of torching police cars, smashing windows or looting stores. The Vancouver Police Department is calling on the witnesses to submit images of the riot and the public has responded, sending so many pictures on Thursday that the police force's website temporarily crashed. Social media campaigns have also taken aim at rioters, posting photos of suspects on Facebook and encouraging online communities to identify them. While the Internet's name-and-shame approach appears to have yielded several quick identifications of Vancouver rioters, the police investigation is just getting started. Rioters who were photographed breaking the law should brace for a visit from police, said Toronto Police Services Det. Sgt. Gary Giroux. "In my opinion, they'll get caught," he told CBC News. Giroux, normally a homicide detective, led a team of 25 investigators tasked with identifying those responsible for damage done during the G20 protests in Toronto on June 26, 2010. His squad has arrested a total of 48 people — though five must first be extradited from the U.S. — and charged them with 257 counts of criminal behavior, including vandalism and arson. Two were found guilty in Ontario courts this week, and 70 per cent of those arrested have pleaded guilty, Giroux said. "All of the [G20] prosecutions are going to be identity-based prosecutions," Giroux said, which means police must establish the suspect charged is the rioter pictured. After the G20 Giroux's team gathered around 80,000 images from the public, social media websites and downtown businesses. These images, combined with CCTV footage and photos taken by police, formed the basis of the investigation. The huge database of photos — "the more the merrier," Giroux said — enabled them to retrace the steps of suspects as they moved throughout the riots. Officers working the case could eventually pick out individuals hiding in crowds of hundreds — like Where's Waldo?, but for anarchists. Gaining multiple vantage points of suspects committing obvious crimes, like torching police cars, was also key to the cases. 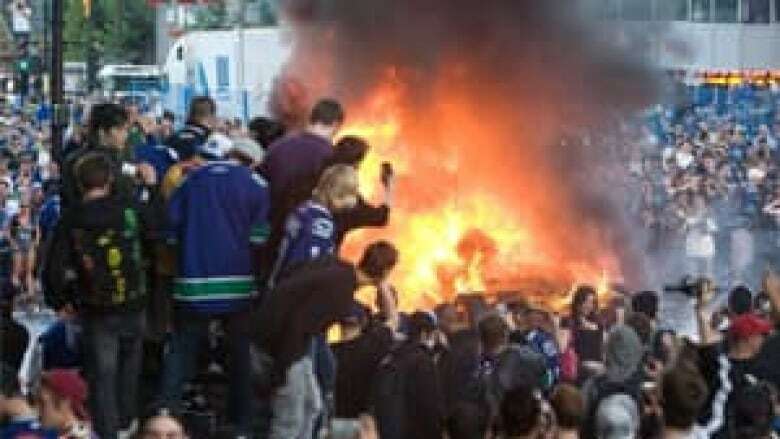 What do you think of the public's response to Vancouver's riot? While online communities have raced to identify individuals based on one photograph, Giroux had to push for more to build his cases, often cobbling together several moments where suspects revealed too much of their identity. "The challenge came in making the identification. We capitalized on mistakes [rioters] made, and they did make mistakes," Giroux said, pointing to suspects who let their face or other distinguishing features show. Giroux predicts that Vancouver police will be successful in tracking down and charging rioters. Compared to organized G20 protestors like the Black Bloc, who took great pains to cover themselves in black attire, many of Vancouver's rioters were disorganized, wearing crude disguises like hockey jerseys pulled over half of their faces, or just plain blatant, posing for pictures with looted goods. Rioters who actually watched Game 7 will be easier to identify as police should be able to track their movement throughout the downtown core, where the City of Vancouver put up massive screens to televise the game. Chris Schneider, a sociology professor at the University of British Columbia who specializes in criminology and mob behaviour, followed the riots through social media, keeping an eye out for seemingly incriminating posts and pictures. There were a lot of both. "In a way, the police don't have to do much of anything … there's so much data out there," Schneider said. "These people are going to get nailed. The police are going to have to make an example of them." Schneider said a mob mentality, where people let personal responsibility slip, took over on downtown streets as well as online. For his own academic research, Schneider took screen-captures of people who were using social media to organize riot activity. He also witnessed many bragging about committing criminal acts in Facebook posts — many of which have been turned into image files and shared online by members of the public. Schneider said publicly shared information like this will likely become police evidence. He expects the investigation into the riots will be "cumbersome" for police, due to the sheer amount of information they need to collect and verify, but said it's important the police don't let rioters off the hook. If they're perceived as soft, Schneider said, there's a risk this behavior will happen again the next time the Canucks fight deep into the playoffs.